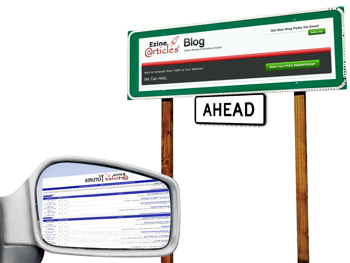 Effective immediately, the EzineArticles Forums have been removed … with all of the traffic being redirected back here to this Blog. This was a very difficult decision that we’ve agonized over since 2006 when we abandoned daily forum updates in favor of this Blog as the central communications hub. Running 3rd party forum software demanded constant security patches to our already highly-customized implementation. In addition, we fought spammers daily. I know there are other forum platforms out there, but it was our goal to make whatever replaced our current forums software to be one that is tied into our current membership interface system. I think it’s absurd to ask you to become a member of “EzineArticles.com” and then register again to participate in our forums with a separate account. To those who love the “forums” concept: While I can’t offer you a date for when they will return … know that we’re still committed to having them. Chris I think this is a good move on your part. This is a very active blog that I visit daily, and can now become even more active. The forums received almost as much traffic as this blog (about a million views a year) even though we haven’t been actively supporting forum members for the past 4 years (something I’ve never been ok with). The [now former] EzineArticles forums had 3,420 members; however, very few (about 20-25) were active on a monthly basis. Yes, the blog should see a near doubling in traffic immediately and then it’ll taper off as the old ten thousand forum pages of content slowly become removed from the index. Also, one more advantage that I didn’t mention yet: This means that the forums are now/will be finally removed from the main Google search box on the top of all EzineArticles.com pages… which means, more of your articles will show up in the results as the forum pages become removed from the index. This was a sore spot for me that we never found a solution for…but now the issue should be eliminated by the end of the year (deindexing usually takes 3-6 months). I found out about the forum a couple of days ago. I became a member and browsed it. I found great information there. Now it is all gone. What a pity! This is a great and easily accessable forum, I’m enjoying it as I speak as I’m a newbie today, thanks ! I’m probably going to be much more active here than the forums. I knew about them but never visited. I think that this is a bad move that will affect publishers. It might be a good move for your blog’s traffic but a blog doesn’t provide the publishers with the tools as a forum does. “Contacting the Member Support Team directly with any questions” most of the times solve the problems, however this doesn’t happen all the times. The forum was a way to share information in a democratic way with other publishers and with the editors. I hope you’ll bring it back. I noticed the forum but don’t think had had the time to join, I can’t remember why I didn’t join but it must have been a good reason. The blog seems to becoming livelier now though it has seemingly been slow. I am personally okay with the blog even though I would have prefered forums as you get to have people post different topics and you can have different categories if this makes sense. If it where possible, I would say keep both. However not knowing the full logistics behind things, you will probably have to make the difficult decisions. This is a good move. Otherwise, we all get spread too thin. It’s better to focus our efforts and updates on the blog. Always looking out for us Chris, like the idea more of our articles will show up in the results, as the forum pages become removed from the index. :) Knowing search engines like content and content is king, they all take time to manage. I now run both on an individual basis. WPressBlog and the newest free Painting Forum on the net! painting-forum.com Hopefully my efforts are not in vein. The decision to move from fora to blog was a sound one. Blogs are today’s medium and although there is still a use for fora, the roles of the two media are different and specific. I look forward to blogging-in occasionally and getting swept up with what is happening at EzineArticles. I was a member of the forum and I think it is a wide move on your part. I didn’t make a habit of logging in regularly as there was never any new threads. I always used to get PM’s as well asking if I wanted to employ a writer. If I wanted to employ a writer, I would go to a freelance board. I dislike SPLOGGERS and Forum Spammers very much! I know how you feel. Phew! Thanks Blaine. At least someone’s with me here… EzineArticles ‘had’ a forum? I am pretty surprised. I would say keep both. However not knowing the full logistics behind things. Good move Chris ~ BTW, I love the cartoon graphic depicting the way ahead and what is left behind :-) Very clever….full marks to your resident ‘cartoonist’! I do not know that enzinearticles had a forum but i think the forum and the blog have their own advantages so in my opinion it`s more ok to have a blog , it`s more “simple” for other people to use , more “popular” , keep up the good work and thanks! I like the forum also, but the blog works to! I like the blog better. I did not use the forum because it seem that people are not using them much anymore. Blogs are simple and stright forward. I did check out the forum several times. I found the information on the blog of greater depth and more helpful. I never even used the forum but I’ll be paying close attention here. As a member of the forums, I’d love to see them come back improved one day but for now, I got much more use out of the blog anyway. I like forums & visit all I can find-Very Interesting. U r invited 2 visit my website often & share it & JESUS with others. One way is 2 visit: http://www.bbnradio.org & then tell others about bbn on facebook, twitter, or however. Also why not visit: worldchallenge.org & share? B JOYFUL! Not happy with your decision to do away with the Forum! Forum has an importance of it’s own & I wonder how it can be replicated in a Blog?!!! Blogs are article-based. Forums are comments based. Forums feels more natural than Blogs. In Forums we interact with each other & help each other out. Of course, if I need any help I can click Contact Us. But nothing can replace the Forum. I suggest that you create a in-house Forum ; instead, of using a 3rd-party software. Please…please consider this in the future. I can certainly see where EzineArticles is coming from. All of us genuine enquirers that would have benefited from each others experiences and suggestions are likely the unwitting victims of sploggers (just learned a new word here). Forums at a site as wide as EzineArticles have their place in minimizing downtime waiting for Support to respond to an question. On the flip side, if not having a forum will augur better for writers, then kudos EzineArticles for choosing to remain focused. Thank you. After running my own forums on other domains, I can well understand why you gave it away. I am only new to EzineArticles.com but I am happy to just have the blog, they are much more resistant to spam and easier to manage. You have a great search engine in the top right hand corner for people to find articles and topics with. I am probably going to be much more active here than the forums. I knew about them but never visited. We are a fairly large company with many copywriters employed who have Ezine accounts. With the new Ezine requirements getting hot and heavy, we are finding it very interesting how very random the rejections vs. the acceptance of article is. We can take ten well written articles, five are approved first time through, five are rejected because the landing pages aren’t to Ezine’s liking. Funny thing is that all ten articles are linking to the same website. While we understand what Ezine is trying to accomplish, we believe your execution is messy. The articles are meant to stand along and reference resources (and thus drive traffic). You are acting like the articles are an intro into a bigger concept. Article reviews are subjective. BUT that doesn’t mean identical errors will pass while others are rejected. If you haven’t yet, please contact our Member Support team and we’ll look into it for you. I’d have to disagree with your last point. While articles are meant to stand alone, your landing page plays a large role in your success as an expert author. Transparency and relevancy are very important and a site that delivers both builds trust with your users. A poor user-experience reflects badly on both of us. The targeted traffic we deliver can only be useful to you if your landing page delivers. If the reader clicks away after they land on your page, what good was the traffic? We’ve always reviewed landing page content. Every article and every link is checked twice by 2 different editors. What you’re seeing now is a stronger stance on link relevancy as it relates to user-experience. We’re digging deeper into author intent and understanding who you are as an expert. i.e. Is your landing page simply a page filled with meaningless words or is it providing value? I submitted my article and it was in review for more then 7 days, so i resubmitted the same article. I see that your articles are in Editorial queues and will be reviewed shortly. One thing to keep in mind is, an article that is edited after it has already been submitted will delay the review process. We recommend making full edits prior to your initial submission to avoid any further delays. I was told that EzineArticles sent me a private email. Where do we go to receive private emails? Provided we have your correct email address on file, you should see that message in your email inbox. If not, you may want to check your spam folder. If you still can’t find it, feel free to send us a message by clicking on the contact link in the corner of your My.EzineArticles.com interface.